Our third Winspiration Vancouver conference theme is "Your Tomorrow Starts Today!" A part of a worldwide movement to embrace change together. A chance to focus together on the joy of life and think about living to our full potential, in whatever way that takes us. 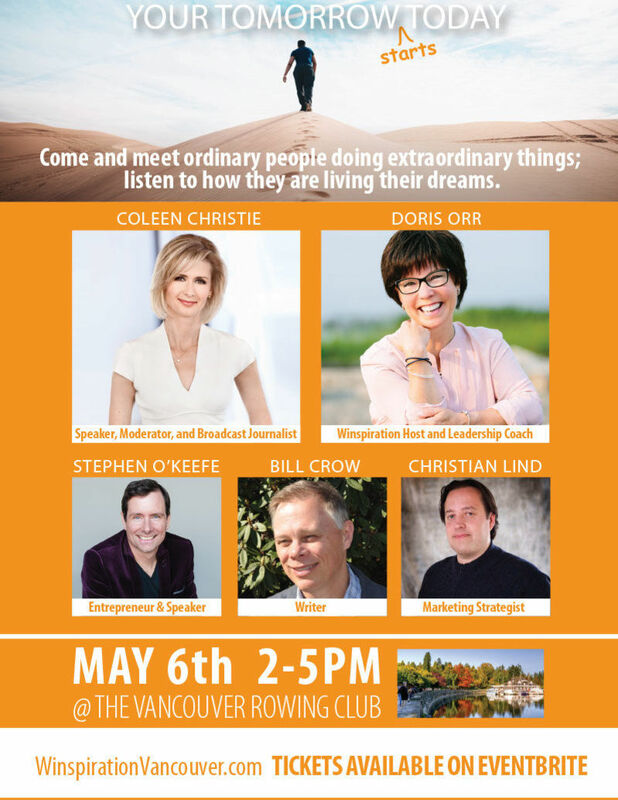 Come and meet ordinary people doing extraordinary things, listen to how they are living their Dreams. Christian is incredibly humble and unpretentious, yet has incredible depth with an unconceivable range of talents and passions that have led to doing truly extraordinary things. He continues to dream big and strives to realize his amazing goals. April is an intuitive coach and business consultant who loves the idea of being able to help other start up entrepreneurs in their first three years - to support and guide them through the bumps and hurdles that come along. She's also available to support entrepreneurs through the transition phase of leaving their full time jobs and dipping their feet into the world of self employment.